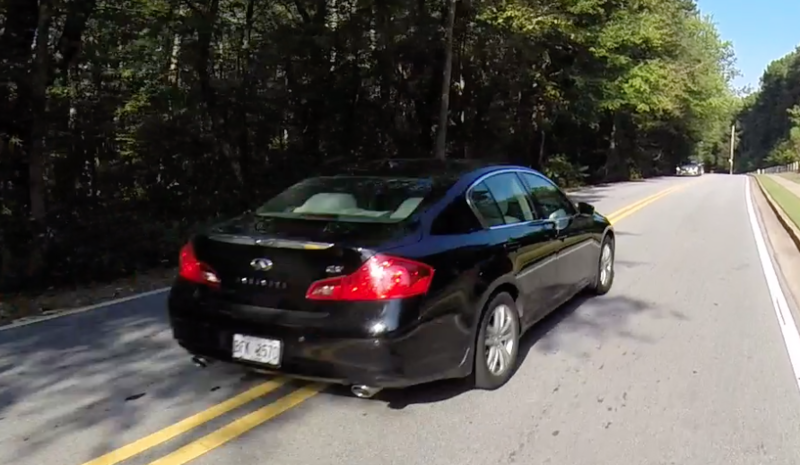 1st encounter: Black Infinity sedan with GA tag BFK2570. Like a lot of motorists, they aren’t willing to wait a few seconds for on-coming traffic to clear before making their pass, putting the other motorist and us at risk of being involved in a head-on collision or being run off the road / hit by an evasive maneuver by the passing motorist to avoid a collision should they mis-judge the closing speed. 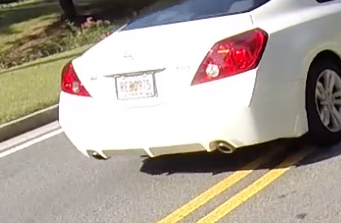 2nd encounter: White Infinity coupe with GA tag REB0975. Same as with the 1st encounter, motorist in a “hurry” which is to stay not willing to be delayed a few seconds who caused an on-coming car to come to a near stop. Of course, it’s the cyclist’s fault since they shouldn’t be on the road… not the driver’s poor judgement, lack of patient or poor motoring skills. 3rd encounter: Green 2nd Gen Toyota 4Runner, GA tag unreadable. Surprise, surprise. Same as the first two encounters. 4th encounter: Cobb County Police Cruiser. I’m sorry, but here we have a Cobb County Police cruiser parked in the pedestrian crosswalk at a school shooting radar. What made me notice this was the jogger who had to run around the police cruiser because he was parked in the pedestrian crosswalk. Talk about either a sense of being entitled to apply a double-standard or just being oblivious to their own poor motoring skills in the name of law enforcement. Yeah, I get that it’s a “good place” to catch speeders and Lord knows, motorists need to slow the hell down on our secondary roads… people doing 55mph in 35 mph zones is “normal” and 60+ mph in 45 mph is not uncommon either. 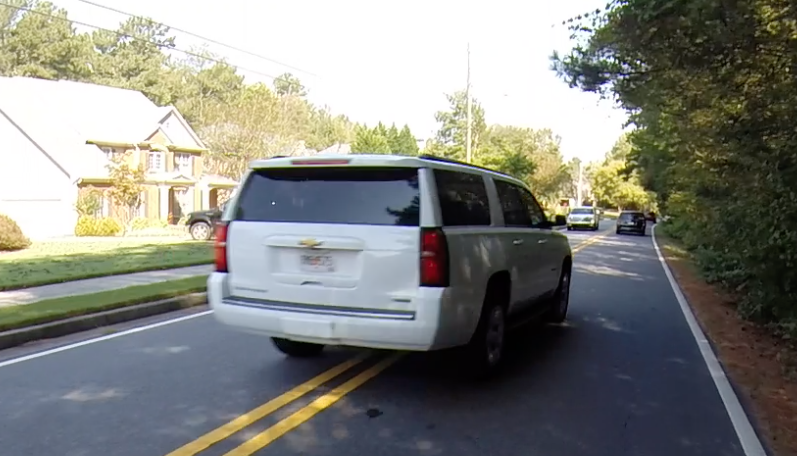 5th encounter: White Chevy Suburban, GA tag unreadable because they were going too fast and I turned my head. 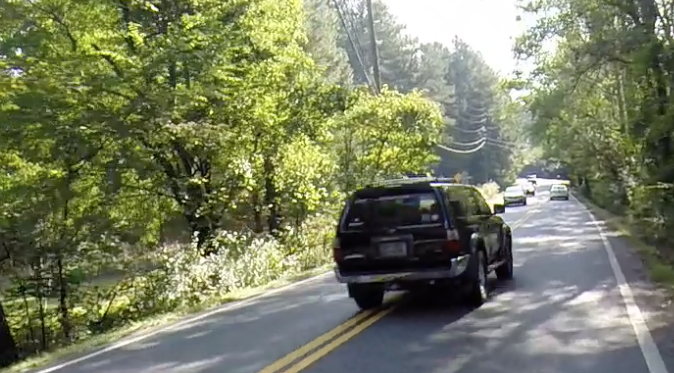 This soccer mom in her 5,900lb Suburban came flying by at well over the posted speed limit and then slammed on her brakes as soon as she was back in the lane so she could pass us, causing the on-coming truck to come to a near stop to avoid a collision. 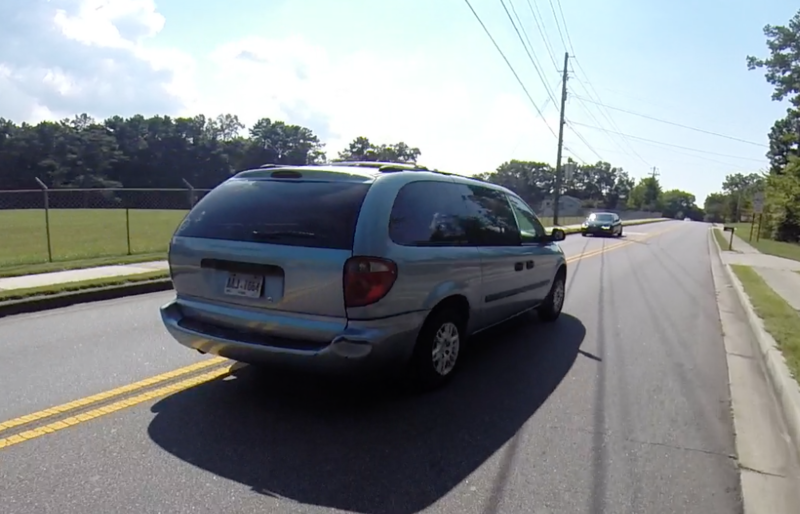 6th encounter: Silver 2005 Chrysler Town & Country minivan with GA tag AAJ1664. 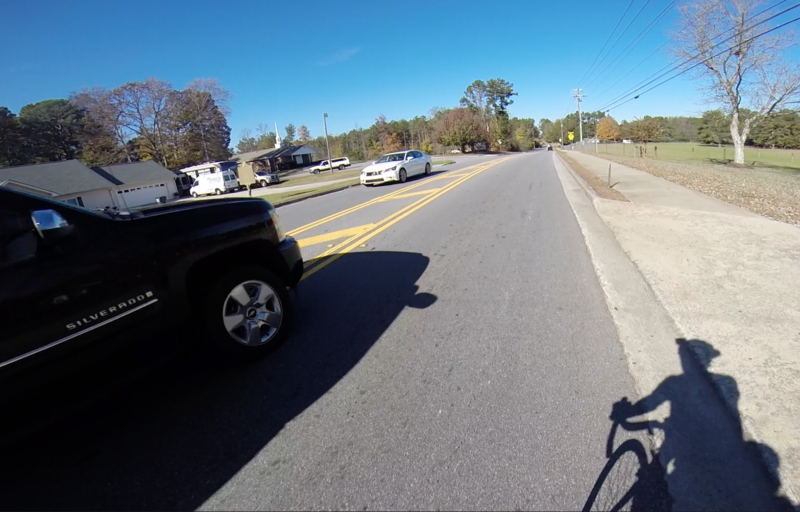 Given we have a fairly side set of lanes here on Acworth Due West Road, this wasn’t as bad as it could have been. But, here again, we have a motorist making a pass with on-coming traffic. What is it that makes motorists who think nothing about sitting at stoplights for one to three minutes, killing idle time spending hours on social media, and being queued up sitting at school’s waiting to pick up their kids because it’s not safe enough for them to walk or ride a bike less than a mile to their school since they’re too close for bus service. Similar to end of October, cold and damp or rainy weather has kept us off the tandem for most of November. 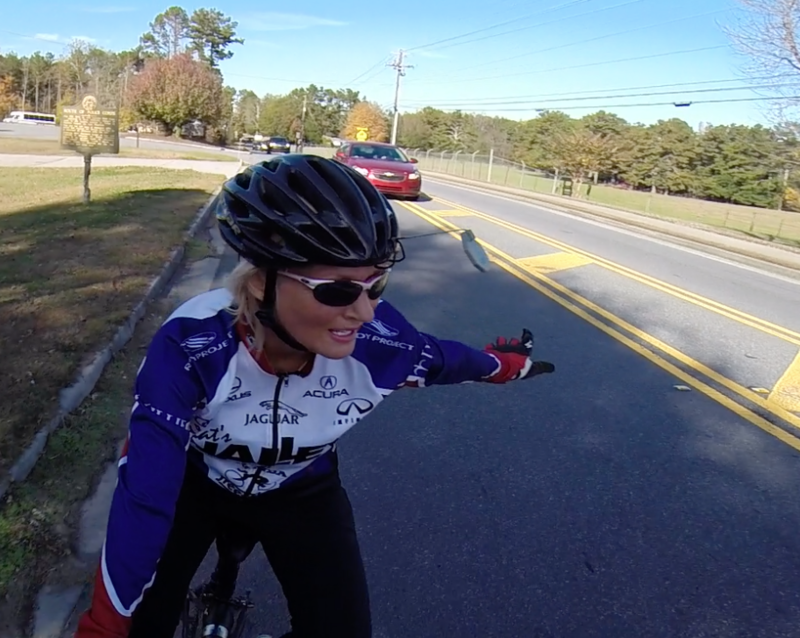 However, the weather gods shined upon us this weekend and gave us a couple of days that were warm enough for Miss Debbie to join me on the tandem for a ride. I should probably note, I’ve been out riding on my single bike but opted to not use the cameras since Miss Debbie wasn’t along. I guess I consider riding with Miss Debbie to be a bit more of a higher risk to warrant having the cameras on my helmet as a potential deterrent to exhibitions of bad motoring skills and/or evidence in the event we are involved in an accident. If it’s just me, I’ll still have Miss Debbie to take care of me and/or she’ll be taken care of financially in perpetuity so no cameras. After the 18 November encounters and one in particular, I may rethink my position. Anyway, here’s what the cameras captured on Saturday afternoon, the 18th of November. 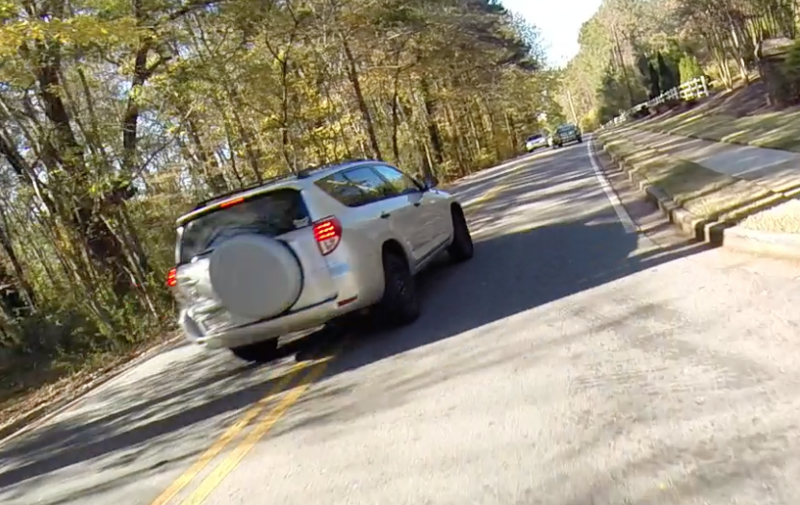 Encounter #1: Silver Toyota RAV4, GA tag unreadable. This guy blew by us doing 55+ mph in the 35mph zone so as not to have to wait until on-coming traffic cleared. As you can see, as soon as he was clear of us and with another speeding motorist coming the other way he was hard on the brakes as he moved back into the through lane. Mind you, this is 200 yards after we turned out of our community onto our loop ride. 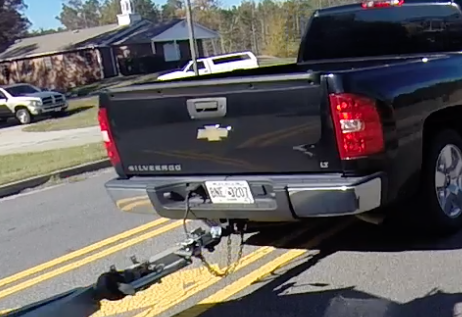 Encounter #2: Black Chevy Silverado 1500with GA tag BNE 3207 pulling fishing boat with GA Reg. GA 05553 PR. 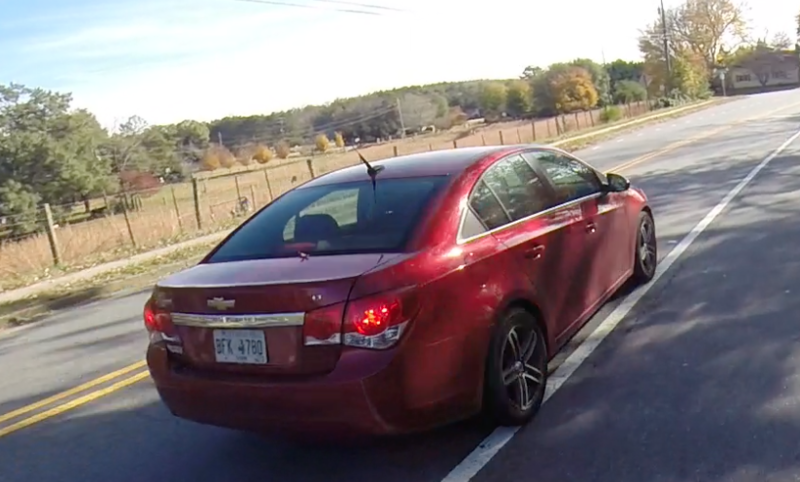 This guy came up behind us in a hurry on Old Stilesboro Road but failed to get past us before the intersection. 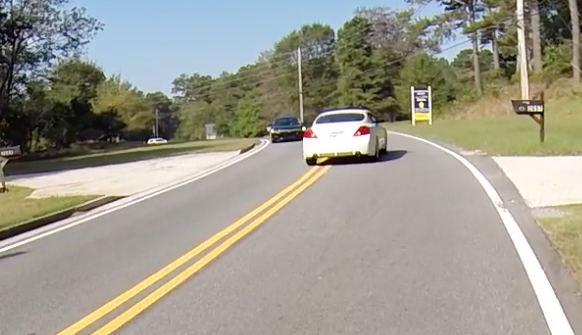 However, as soon as he turned onto Acworth Due West road he was wide-open-throttle to get around us, driving well into the hashed median area to make his pass. Normally, that would have been fine and given us plenty of room… except he was towing a damn boat! So, we were treated to a nice, up close and personal view of his fishing boat as he began to move back into the lane well before the boat and trailer were clear of us. Encounter #3: Terra Partners Logistics / FedEx Contractor delivery truck with USDOT Reg. 265752, possibly GA tag RPW5266. Let me say right up front that we like our FedEx delivery guy, and he’s been servicing our neighborhood for several years. 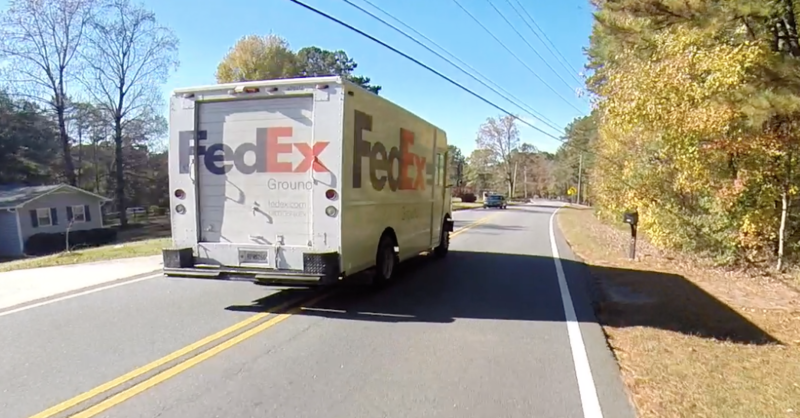 However, that said, I’d have to say that FedEx has some of the worst drivers — over the road and local delivery — that I’ve ever encountered. The over-the-road drivers routinely sit in the fast lane when there’s no reason for them to be there, often times pacing other trucks and tying-up traffic for several hundred yards. The local route drivers, OMG: some of the stuff I’ve seen them doing. So, here we go: while he gave us plenty of safe passing distance — which I truly appreciate — he made his pass even though there was a car coming the other way… and he was in no particular hurry to get back into his own lane which caused the other driver to come to a near stop. 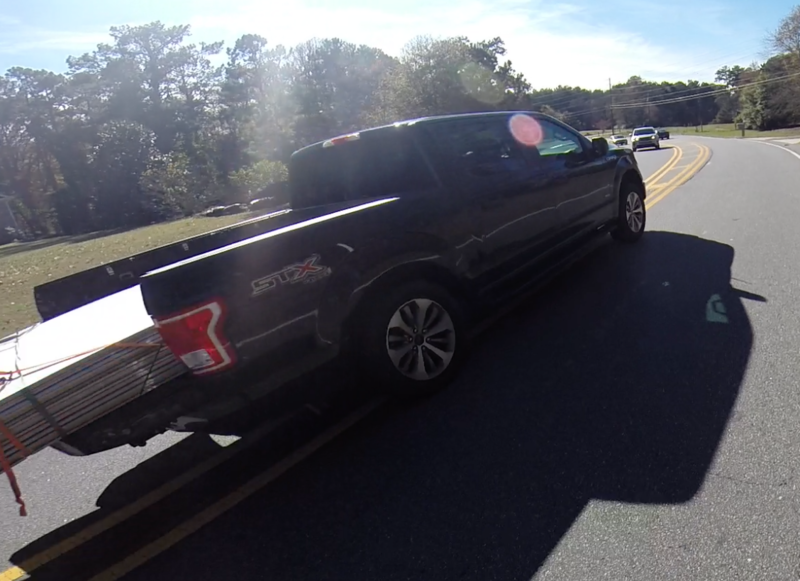 Counter #4: Black Ford F150 / STX with tag hidden by load. If memory serves, just about every time we ride we have at least one motorist who makes a pass on what is mostly a blind curve betting that they can make the hashed median before they end up coming head-to-head with an on-coming car, and most of them don’t make it causing the on-coming motorist to take some type of evasive action. 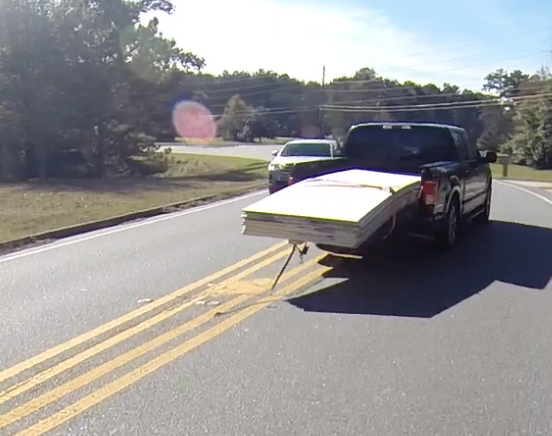 Today was no exception, as we had this guy hauling 12′ long sheet rock in his 5’6″ bed with the tailgate down try to power by instead of waiting a few seconds until he could actually see traffic ahead and make a safe pass. Yeah, you’re going to be unloading sheet rock for a good 15 minutes, so it’s important to put other drivers at risk or at least to share the bejeezus out of them to save 15 seconds. 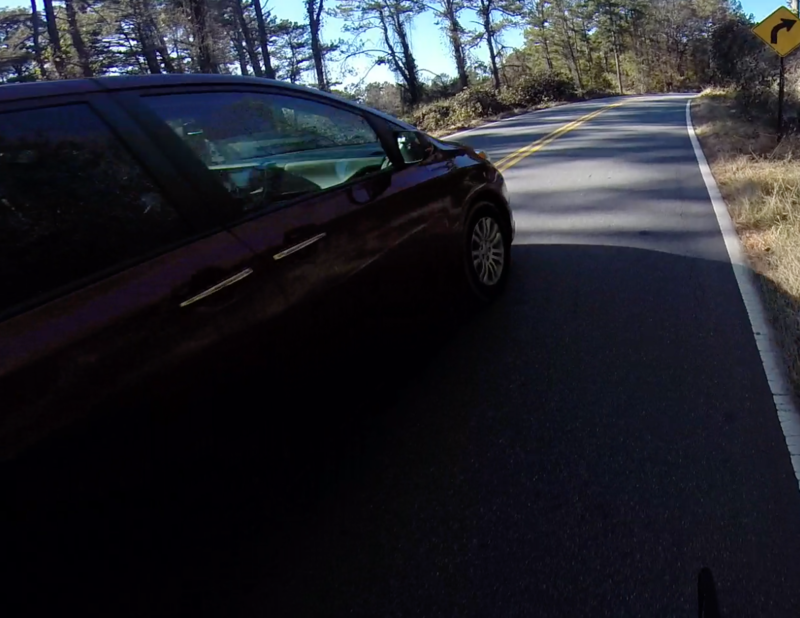 Encounter #5: Burgundy Toyota Sienna XLS with unreadable GA Tag. As you can see from the yellow warning sign, this is a blind curve on a hill. Once you get past this corner you can see a good 1/2 mile up the road, but that would have taken this motorist an extra few moments on a Saturday afternoon so, instead, they decided to make their pass and HOPE there wasn’t a car coming around the blind curve. Encounter #6: 2016 or 2017 Burgundy Chevrolet Equinox LT with Georgia Racing Hall of Fame vanity plate RQ318. This gentleman came up behind another car that had a cautious driver who didn’t want to pass on a hill with several blind curves but was in such a hurry that he felt compelled to toot his horn at the other driver in an effort to get them to move along, or at least that was my assumption. It could have also been the driver of the white Audi letting us know he was back there with two taps of the trumpet horns. 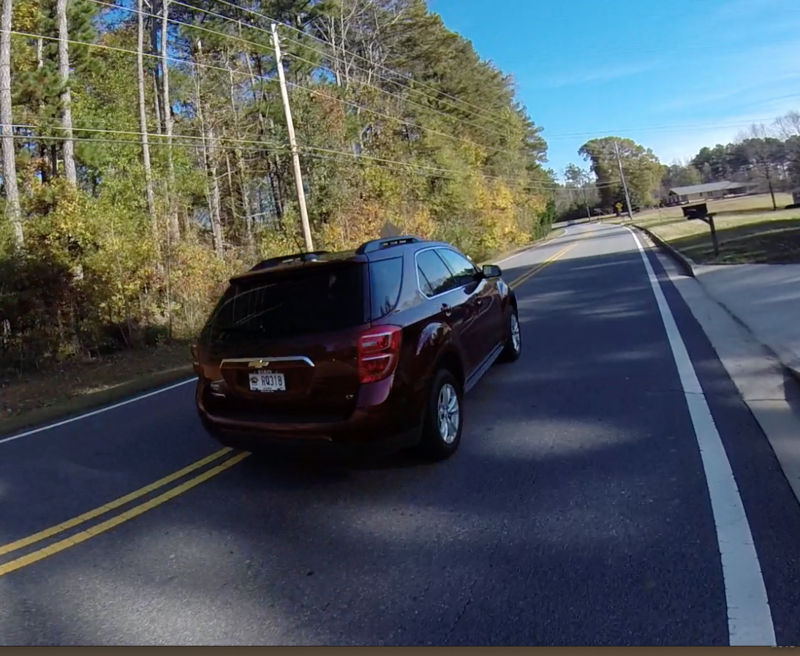 Mind you, hardly anyone uses a horn here in Georgia… I mean, it’s really rare. After the driver in the white Audi in front of the maroon Chevy Equinox finally felt that it was safe to pass he did so and gave us plenty of room; thank you sir! Mr. impatient came up behind us and sat right on our back wheel until he ‘thought’ it was clear enough to pass, even though it really wasn’t because his view had been blocked by a white Cadillac Escalade as well as a blind curve in the shadows. Sure enough as he passed as close to us as he could, up ahead was on on-coming car that had to drive off the road as he made his pass. and, if that weren’t enough, he felt the need to toot his horn again when he was right along side us and whether intentional or not, he also swerved slightly right at that same moment…. something I assumed to be an over act of intimidation. 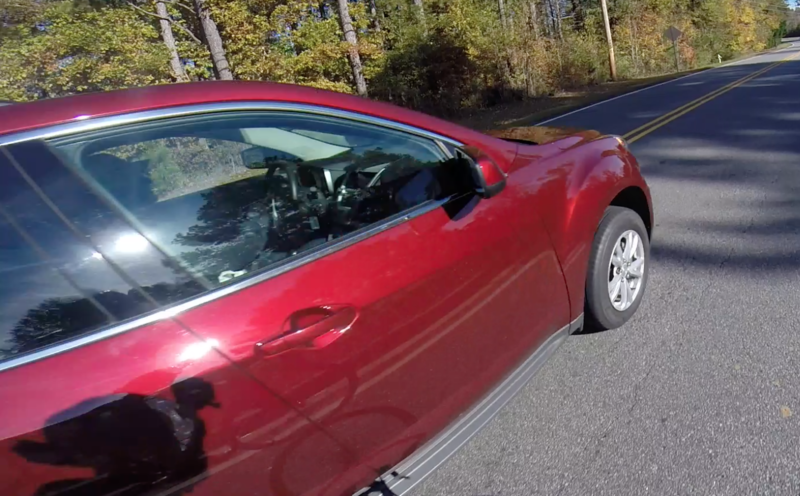 In fact, this encounter bothered so much that in addition to expanding into a video linked below, I also reported the incident to the Cobb County Police and sent them a link to the video. We’ll see what, if anything, comes of that. As you have probably observed on your own — noting these video captures are merely confirmation not anything new — there are just too many motorists of all ages, incomes, gender, political affiliation, etc., who just don’t have a clue how to share the road nor any interest in accommodating other road users because they’re all “in a hurry” and don’t want to be bothered to take a breath and yield for a moment. And, here’s the rub… I bet these are all good and decent people when they’re not behind the wheel of a car. Of course, this isn’t anything new. Here’s a link to a 6-minute long, 1950 Disney animated feature called Goofy Motor Mania that captured the metamorphosis that takes place when an otherwise nice person gets behind the wheel of a car. It’s entertaining but also spot on in many cases.